Bunkyo Azalea Festa (文京つつじまつり) is one of three major flower festival in Bunkyo Ward of Tokyo. It is held at the Azalea garden of Nezu Shrine. 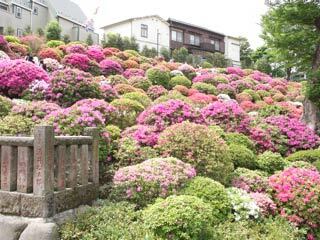 There are 50 kinds 3,000 Azalea trees in this garden. From the middle of April to the beginning of May, you can enjoy beautiful Azalea flowers. Festival starts: The beginning April to the beginning of May. Garden opens only during the festival. Azalea in Japanese is called "Tsutuji." During the festival, many food stands, Sweet Sake store and also nursery shops opens at the shrine.